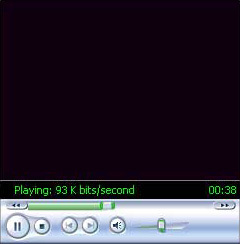 Windows Media Player Archives - Page 2 of 2 - C:Amie (not) Com! Windows Millennium… The final stage in MS-DOS’s evolution. With this release of Windows, 9x is no more. As with a lot of Microsoft products… you always feel that you get lumbered with MegaBytes of unnecessary data, programs and dll files. You could call this page the Head Quarters of the “Say No To 7” campaign. So what can be done about it:. This application may be Microsoft’s first attempt at an all in one media player, and in my opinion… they didn’t quite hit the mark. The biggest problem with it is its resource requirements. They are huge. The application takes far too long to load even on the fastest of systems. This of course means that that you will run out of available memory, run up a huge swap file and have to reboot the system. There are still problems with the CD audio, you are lumbered with features that you will never use such as the mobile device synchronisation options. All of these could be optional and save on the space.. but no. As with windows, office and so many apps before it you can’t. * After this point, and only if you are an advanced user, you can access the system registry and remove all references to Windows Media Player, WMP, mplayer and c:\program files\Windows Media Player . Be sure to back the registry up first of all and Re-Boot after you have finished. This will ensure that you have removed most traces of 7 from your system, and will help keep the registry tidy. You can also remove certain system files regarding Windows Media Player. Click Here to download a partial list. New Version 1.3 – Now with Auto Start support! After Running this update you will have to install the registry update files found on the desktop. These files update the Add/Remove Programs tab as to the presence of CD Player and enable the CD Audio auto start feature. I plan to write a automated installation file soon. You will now have removed Windows Media Player completely from Windows ME. * After this point, and only if you are an advanced user, you can access the system registry and remove all references to Windows Media Player, WMP, mplayer and c:\program files\Windows Media Player . Be sure to back the registry up first of all and Re-Boot after you have finished. This will ensure that you have removed most traces of 6 from your system, and will help keep the registry tidy. You can also remove certain system files relating to Windows Media Player. So, you’ve decided to do the honourable thing. You value your system resources, that or your worried about your Grid Computing project results being crippled by WM7. Microsoft, are in fact updating Windows Media 6. They don’t publicise this, as they want everyone on version 7 or above. Microsoft are updating 6.4 to suit the new codec’s and Internet Explorer versions that they produce. This inevitable was their own mistake in deciding not to allow Windows 95 and NT 4 users to use WM7. For what ever reasons they chose to do this, technical or political fortunately for us we can still get the most out of 6.4. If your using Windows Media Player v6.4, you can extend its functionality by installing the following patches and utilities. The remaining life in Windows Media Player 6 is on borrowed time. With Windows 95 having been retired on Dec 31st 2001 and likewise with NT 4 / Windows 98 being retired in July 2003 users can expect 6.4 to become a distant memory. Microsoft have always had a thing about it’s media players. Distributing the old MCI version of it right up until Windows Millennium. Even then in Windows Millennium 6.4 remained present side by side with 7.0. Windows XP no longer included the Windows 3.11 MCI version, but 6.4 remains side by side with 8.0 & 9.0. With the release of Windows 2003 Server, the renamed Windows .net, Windows Media Player 6.4 still ships along side 9.0. Windows Media Player 9 updates that modify the core .OCX drivers in media player will however continue to incriment the Windows Media Player 6.4 build number, as has been shown by the univeral rise to build version 1128 with the relase of Q808226. Windows Media Services 9 is upon us, and with this comes Windows Media Player version 9. What makes this significane is that it, unlike version 8 can be installed on other Operating Systems. I can confirm from seeing the beta’s that 9 installs on Windows 2000 and runs quite well. I’ve not tried it on any 9x OS, however under Microsofts Operating System retirement policy, I would expect it to install on Windows Millennium, and perhapse Windows 98SE, but I would hold me breath over any of the 98’s. Windows Media Player 9 is virtually identical aestetics wise to that of Windows XP’s version 8, however there have been refinments to both the code, the layout, the look and most importantly the codecs and underlying backbone of Windows Media format. The player in its beta format handles better than Windows Media 7 does. However users won’t be surprised to learn that it covers the same sort of CPU and memory overhaeds as 7.1 and 8 respectivly do on their OS’s. This is perhapse the price we pay for eveoloution, who knows. The crux of the matter is that 6.4 unfortunatly is becoming more and more unstable especially when connecting to streaming servers. Its reliability is deminsihing. With this volly of new Windows Media technologies, I can only guess that there will be new ActiveX plugins finally to facilitate the advances in browser technology and in Streaming technology. This change will spell the ultimate end for 6.4. Even if the 9 format will play on 6.4, it is unlikly that it will be able to play back on 6.4’s ActiveX, that has for so long been the only realy way to deliver any Windows Media, ASx / WMx / Proparetly WM6 format content over the internet. I still use 6.4 for my MP3 listening and for video playback where it can handle it. But I’m increasingly using 8 to watch streaming content and inevitably under Windows XP to listen to Music CD’s. Reluctantly I’m being dragged kicking and screaming into the 21st MultiMedia century, and I imagine so will you. Although not necesarily with Microsofts player. The Question that I can see your all posing to me right at this moment… Can I remove Windows Media Player 9.0.. answer… Not the Beta version you can’t! Having now had a chance to play with 9 properly, I have to say that I am very much impressed. Microsoft have clearly been listening to the Windows Media community over it. Can it be done, can it be removed From Windows XP? No, not using the methods described here on this page. I also do not want to experiment with this as, until we see Windows Media Player 8.1 arrive, there is no way to re-install it once its gone, short of a system re-install. However, due to the current legal wrangles going on between the Microsoft Corporation, the United States and the European Union. Microsoft have submitted to the findings of the litigation and, in the forthcoming Microsoft Windows XP Service Pack 1 (SP1), estimated to be released to the general consumer in August / September 2002. Usefs will have the ability to uninstall at least the front end of Windows Media Player from their systems using the Control Panel Add / Remove programs applet. The Service Pack will also allow users to uninstall Microsoft Internet Explorers front end, Windows Messenger (Currently removable via the sysoc process) and several other previously embedded utilities. This will default all Media File types to open in Windows Media 6.4. CD Audio, VCD and DVD disks will still open in Windows Media Player 8. Now that we are seeing openness on the part of the Microsoft Corporation and its integrated products, where does the future lie for the Microsoft vision. This is something only time will tell, however, if Real Networks get their media player onto a Microsoft Operating system CD ever again, Microsoft can say good by to me as a customer. I personally don’t want anything to do with Real Player or their dire codecs. The time of reckoning has finally arrived for 6.4. Here for your viewing pleasure is the new ActiveX control for Windows Media Player Content.